It’s difficult to decide which is the more remarkable: that Pokeno boasts an award-winning vineyard or that it’s wine is made by a pioneering heart surgeon. Overlooking the vast Yashili infant milk formula factory in the burgeoning North Waikato settlement of Pokeno lies Hitchen Road Vineyard. It is home to Ken and Tricia Graham, who share their 40 hectare piece of paradise with some 80 Poll Dorsets, around 50 head of cattle and rows of carefully tended grapevines from which they make their acclaimed wine. Nearly 30 years ago Ken, together with Clive Robinson, made history when they performed the first heart transplant in New Zealand at Green Lane Hospital. It signalled a new era in treatment options available to patients suffering from terminal heart failure. Then in 1994, Ken and Tricia established Hitchen Road Vineyard to provide Ken with a passionate interest for ‘life after surgery’. The grapes are planted over two hectares devoted to chardonnay, pinotage, malbec and a trio of Italian varieties – sangiovese, dolcetto and montepulciano. The wines are much vaunted by wine writer, Michael Cooper, who has described them as: ‘skilfully crafted, highly enjoyable wines priced so sharply that the quality must often be underestimated’. Hitchen Road wines have won both silver and bronze medals in the annual Romeo Bragatto Conference and feature regularly in Cooper’s annual buyer’s guide to New Zealand wines. 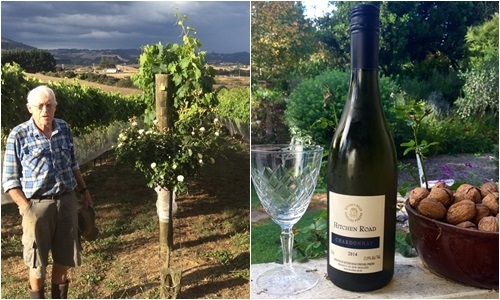 One of the couple’s main reasons for establishing the vineyard in Pokeno was its proximity to Auckland, essential while Ken was still working and on call. Trisha spent a year looking for somewhere within half an hour’s drive of Green Lane Hospital before finding the Hitchen Road block with its beautiful views over the north Waikato. Those views now include the Yashili factory but it’s not something that bothers them. “There’s no noise, no smell, it’s something we just accept,” Ken explains. All the wines are hand-crafted on site from grapes that are grown on the property. The only process that takes place off site is bottling. The Graham’s grow three Italian reds, two of which are regular performers and one, sangiovese, which Ken says is more temperamental. The couple chose to plant Italian varieties to give Hitchen Road a point of difference from the industry’s main producers. Aged 79 and 77 respectively, Ken and Trisha take care of the vineyard themselves apart from employing pickers at cropping time from late March through to April. A former chemistry teacher, Tricia is responsible for the ‘lab work’. On a good year they can produce 600 cases but this year they will struggle to make 200 thanks to a cold spring and following rains which has resulted in a ‘miserable crop’. The Graham’s have acquired equipment such as a crusher/de-stemmer, press, and fermenting vats from various sources and buy in new oak barrels at $1000 a piece. The wine is bottled in Henderson and then returns to a cold store in Waiuku prior to being couriered to customers across the country. Most of it is sold over the internet through the label’s website, through occasional cellar door sales and at the winery’s annual open weekend and art exhibition. Locally, it is stocked at the Tuakau Hotel bottle shop. The couple believes people should take up wine growing only if they have a real passion for it.